There's a lot here to like, not least the price-to-spec ratio. 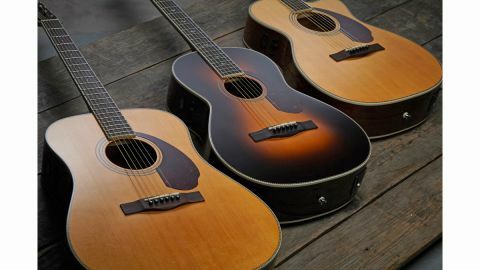 The Paramount range centres on three body styles - the PM-1 dreadnought, PM-2 parlour and PM-3 triple 0 - with all spruce- topped solidwood construction, with scalloped X-bracing, and gloss finishes in two specification levels, Standard (at £519) and Deluxe (at £629). Here we're looking at the PM-2 Deluxe. The Deluxe has rosewood back and sides and is available in either natural or a same-price old-style sunburst. A nine-strong range that all come with hard cases. Despite the quite generic body styles, Fender maintains there's plenty of 'Fender DNA' here: aside from being conceived over a two-year period by Fender's top luthiers, we have '60s 'Concert Tone' inlays, '60s checkerboard rosette and purfling, a headstock shape inspired by the '70s F series acoustics, a '70s bridge design, a late -40s-style Fender logo and the 'cloud' pickguard seen on Kingman acoustics. All Paramounts are electros with a unique Fender/ Fishman preamp. The modern-style design has a small squashed-oval screen displaying the onboard tuner, with three rubber-knobbed rotaries below it for bass, treble and overall volume. You engage the tuner by pressing on one side of the display and there's a phase push-switch on the other side. Each preamp is apparently voiced to suit the different body styles, too. Our review guitar is light and resonant, with a full-shouldered C-shape neck profile. The parlour, the only 12-fret in the range, size-wise is in stark contrast but retains the mid push, albeit with a tighter bass. The parlour features a 628mm (24.7-inch) scale and 45mm (1.750 inches) nut. The new-design pickup and preamp system is both classy and functional. The tuner is fast, the bass and treble EQs offers plenty of range, and that phase switch can be really handy on stage for feedback rejection. For the most part, each of the PM range's acoustic character comes through amplified and, overall, there's a modern, 'enhanced' tonality with a near ubiquitous piezo tonality, which, frankly, we all take for granted, even though it's really not that natural sounding.